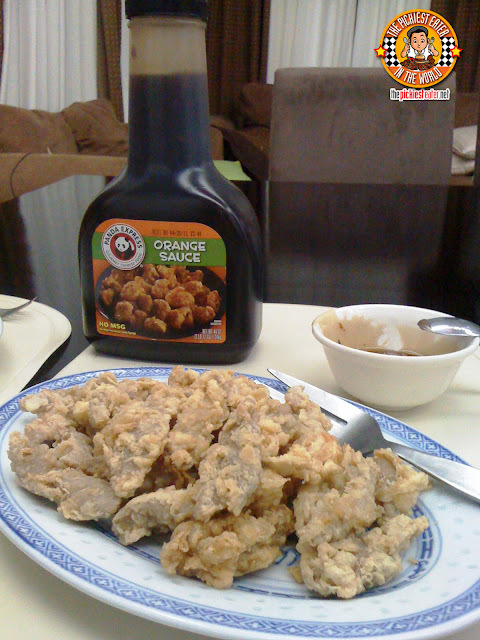 THE PICKIEST EATER IN THE WORLD: GROCERY FINDS: PANDA EXPRESS ORANGE SAUCE! I'm starting a new Category to my blog, called "Grocery Finds", to be posted every Saturday or Sunday. These are some cool stuff that I get at the supermarket that I would like to share with you all. Direk Pao posted a pic of a bottle of Panda Express orange sauce (P399) in his hand on his facebook page last week, effectively driving me into a frenzy. It all of a sudden became my civic duty to go out to S & R to grab a bottle for myself (I actually found a reason to renew my membership). 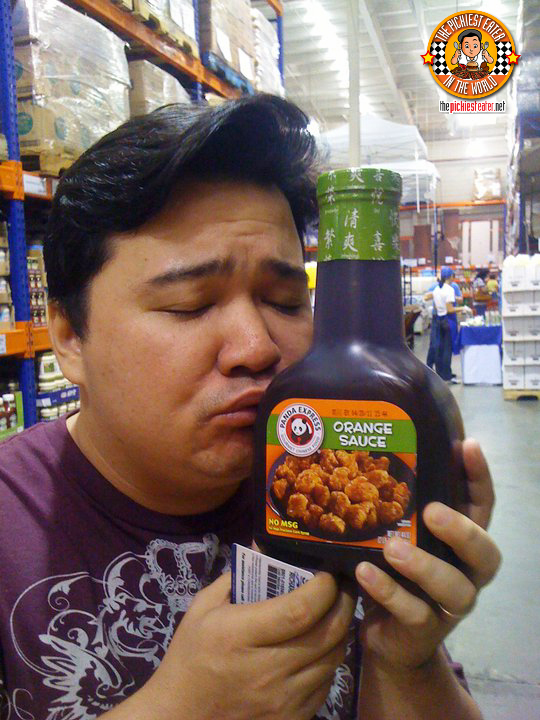 During a trip to Hawaii a few years ago, I remember getting my first taste of Panda Express's Orange chicken, and loving it. Since they don't a branch here yet, this was obviously the only chance I could get to get a taste of Orange Chicken once again. 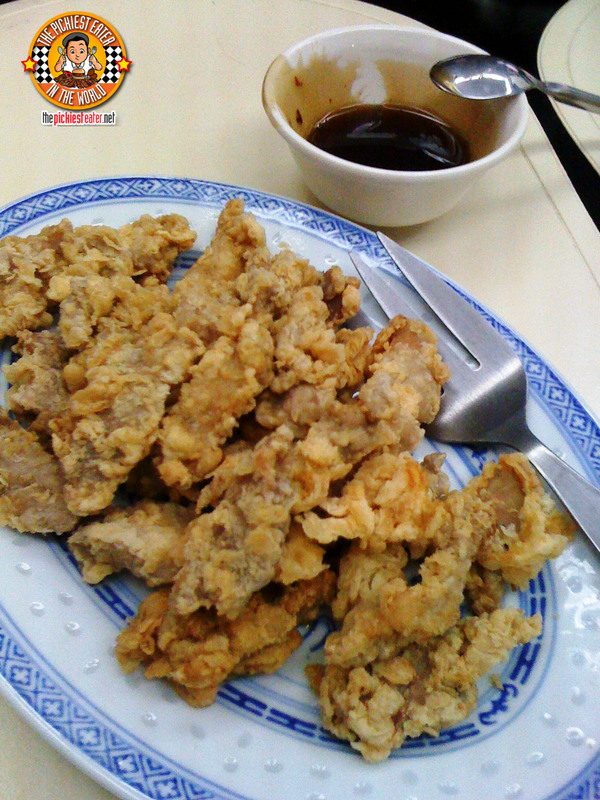 The best Orange Chicken that i've tried on our shores has to be from the now defunct "Chubby China" that used to be in Greenbelt. I heard they had a branch in the Robinson's Summit building in Ayala, but that was a couple of years back, so I don't know if it's still there. Anyways, falling into the category of "meant to be", we had some left over thigh fillet in the freezer. I had some seasoned chicken cutlet dredged in flour fried up, and armed with the newly purchased bottle of Orange Sauce, We were ready to go! The bottled sauce unfortunately doesn't taste exactly like the original. At least, not when eaten as a "dip" (meaning just pouring the sauce over the chicken). Don't get me wrong, it's still a good sauce, but it tastes more like a mixture of plum sauce and sweet chili sauce, mixed with orange rind to make it a bit more sour than the Panda Express sauce I was hoping for. I told my brother about it, and he suggested throwing the sauce into the mix when frying the chicken, and adding a little sugar to help neutralize the sour taste. I have yet to try that..
Would I recommend people to buy the sauce? Don't get me wrong, it's a good sauce on it's own, but if you're a die-hard Panda Express fan that's expecting for the exact sauce of the Orange Chicken, then no. But maybe if I try what my brother suggested and it works out, It could change everything. I'll update soon. *As you see in the top picture, the reason why I always wear a hat is because without it, my hair makes me look like Jimmy Neutron. Gotta Blast! I think we should start a crowd-sourcing project on finding the best way to utilize the sauce to achieve the original Panda Express taste. There are recipes floating out there on the net, we should take turns trying them to see which one is closest. My brother also loves the Orange Chicken from Chubby China (*he works at Chowking now), I think they have a branch at NAIA Terminal 3. Thanks Mo! I'm checking your blog out as we speak! mind if i linked ya?